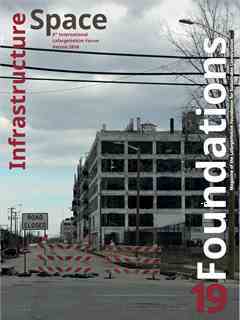 Foundations 20 is dedicated to the 5th cycle of the regional LafargeHolcim Awards. Sarah Nichols and Marc Angélil set foot on five continents to represent the LafargeHolcim Foundation at each of the regional LafargeHolcim Awards jury meetings. 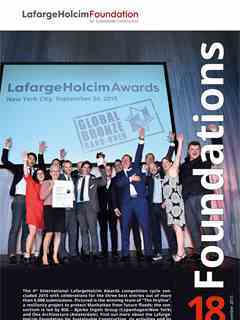 Entries must stand out to get nominated for a prize, they conclude, “and for that you must deliver truly special results.” Foundations 20 lets representatives of LafargeHolcim set aside their “corporate hat”. Dominique Corvez, Mohsen Ech, Carlos Espina, François de Larrard, and Emmanuel Garcia speak about their experience in the regional Awards jury meetings. The magazine also takes a close look at the LafargeHolcim Building Better Recognition, the concrete bases of the Awards trophies produced at Messidor Association and the Research & Development Center of LafargeHolcim in Lyon. 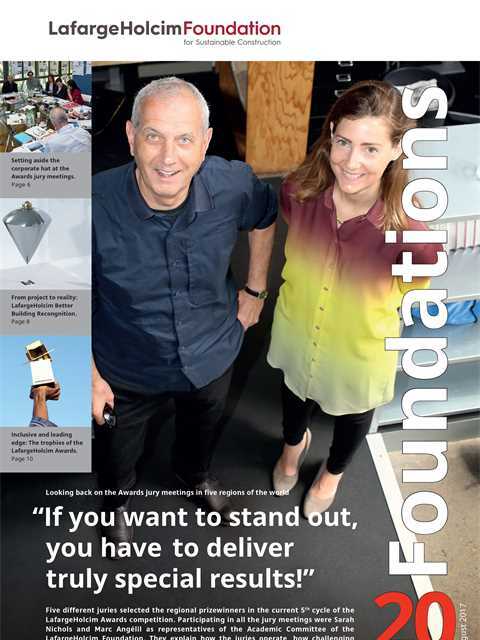 And there’s more: The Foundation team shares behind-the-scene stories - including why a security officer at Lyon airport knows all about the prizes of the LafargeHolcim Awards, and why sustainable construction is just “common sense” in the Australian highlands.